Call 800-511-0295 for current gold jewelry pricing which will usually be less than the advertised price. The Filigree Cross Keepsake Urn measures 3/4" tall x 5/8" wide x 1/4" deep. It is available in Sterling Silver (top photo), Gold Vermeil (lower photo), 14kt Yellow Gold or 14ktWhite Gold. Care instructions, a small funnel, glue, and filling instructions are included. The keepsakes are presented in a black velvet gift box. Engraving is limited to 6 characters. 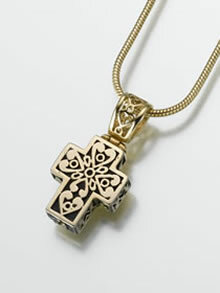 Keep in mind that if you engrave the Gold Vermeil cross, the letters/numbers will be in Sterling Silver as the Gold Vermeil will be etched away in the engraving process. Please call for current pricing on 14kt Gold items.